In the microbus bound for the highest village in Java, women in headscarves mopped up rice delivered by a woman who conducted business from a squat in the street. My friend Stefanie and I sat in the back of the bus, fielding questions from villagers who wanted to know our religion and marital affairs (which, of course, there were none). Exhausted, we slipped off our shoes. Through the open windows, we could feel cool air from the climbing altitude wafting in from an atmosphere that was too dark to see. The bus assistant repaired a break in the bus engine, which kept us waiting upwards of an hour in the mist, and rewarded himself with a jackfruit the size of a cabbage. As the bus kicked into gear, the man stripped off the meat of the fruit like the skin of a tender chicken. Between ferocious swallows, he offered a bite of his treat. Strips of it passed through the dirty fingers of gentle women into my hands, and I placed the fermented parcels in my mouth. Pungent. As the bus hiked the hills, the veiled figures disappeared into the dark. 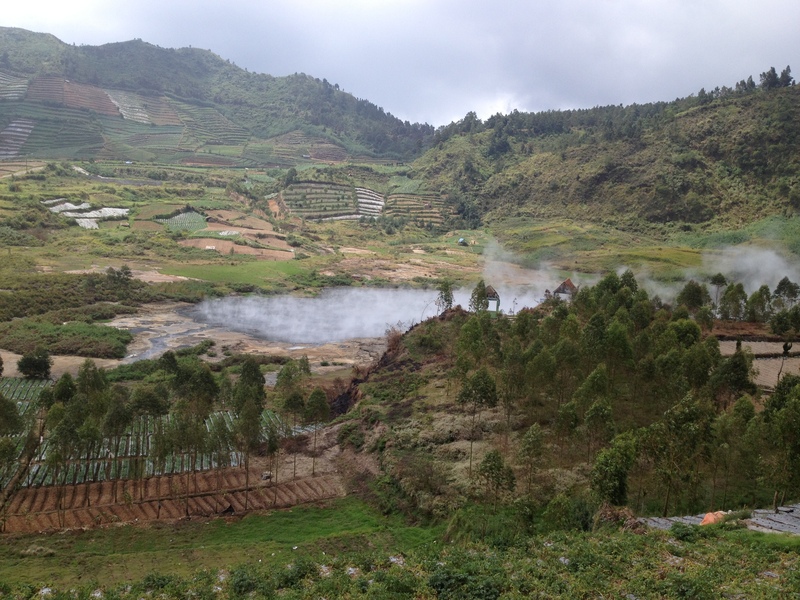 Upon arriving in Dieng Plateau the air was cold like a Midwestern Fall. For the first time in Indonesia I wore a sweater and inhaled freshness nonexistent in the polluted cities of Central Java. Stefanie and I found dinner at the only restaurant open at 8pm (the village wakes at dawn), where the eggs and vegetables were already half-cold, and where the owner of the restaurant smoked cigarettes while reheating the day-old cuisine: served with a chili sauce of bright green. At the homestay, a young Muslim man and woman, out for a sinful getaway, introduced their relationship under the soically-permissible category of “friendship” and told us of their plans to watch the sunrise. Late that night, the couple could be heard giggling together in bed. 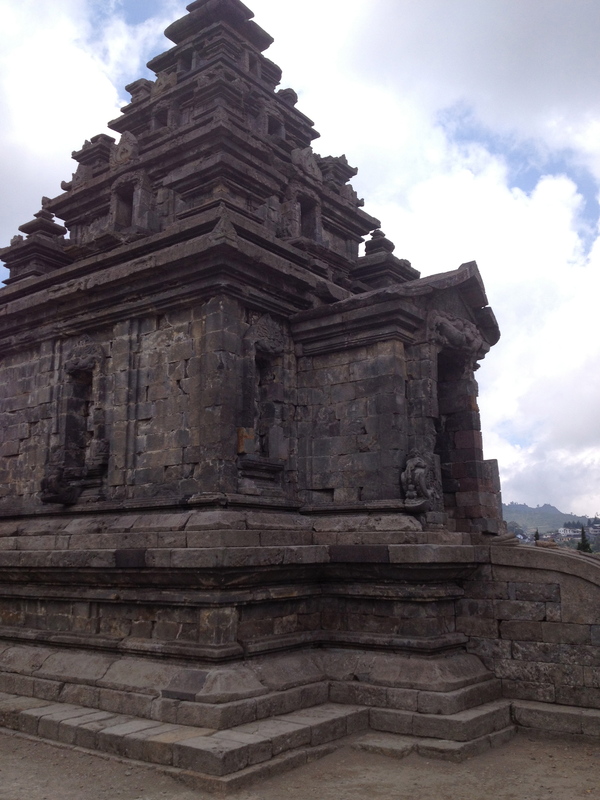 Near the homestay was a Hindu temple complex. No one practiced the Hindu religion in this region since centuries before, when Islam came to stay. 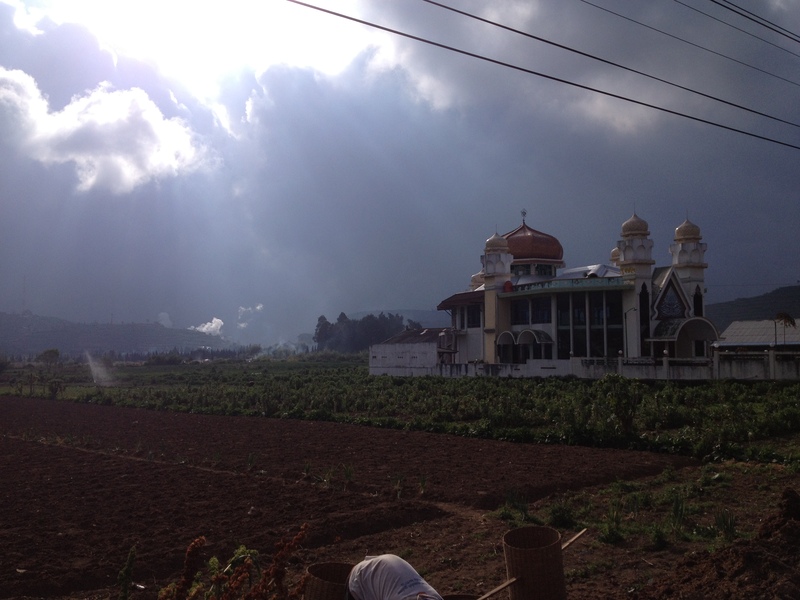 The first morning in Dieng Plateau, I passed through a garden onto a vast rectangle of sand, where three or four 8th century Hindu temples stuck out among the background of farmland like small spaceships. Visitors were free to enter the relics, which bore staircases protruding from door-top engravings of open-mouthed gods. From my foreign observances, I could only note that the interiors of the temples seemed the same: cold, simple, and closet-sized. At the center of each was a large stone bowl-like structure and, beneath it, pools of red wax piled from expired candles lit for show. 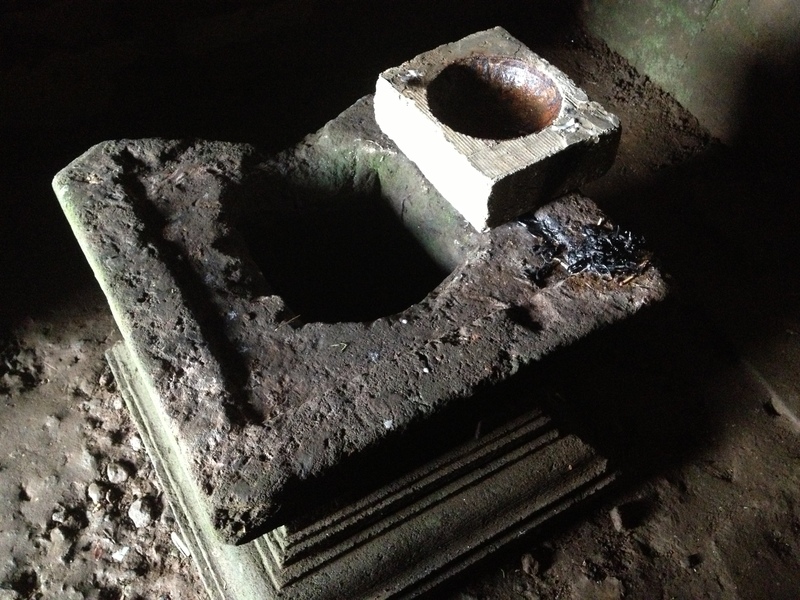 There was a lingering smell left by incense that still poked out from between the stone bricks. The walls were frigid and spare. They seemed to hint at something holy, though — I admit — perhaps it was only superstition that brought me to feel filled with an intimate, unearthly coolness. Exiting the last temple, I felt ashamed for still being ignorant of Hindu tradition, which beforehand I had felt too Western and too skeptical to touch. Fortunately just outside was a figure even more ignorant than I. 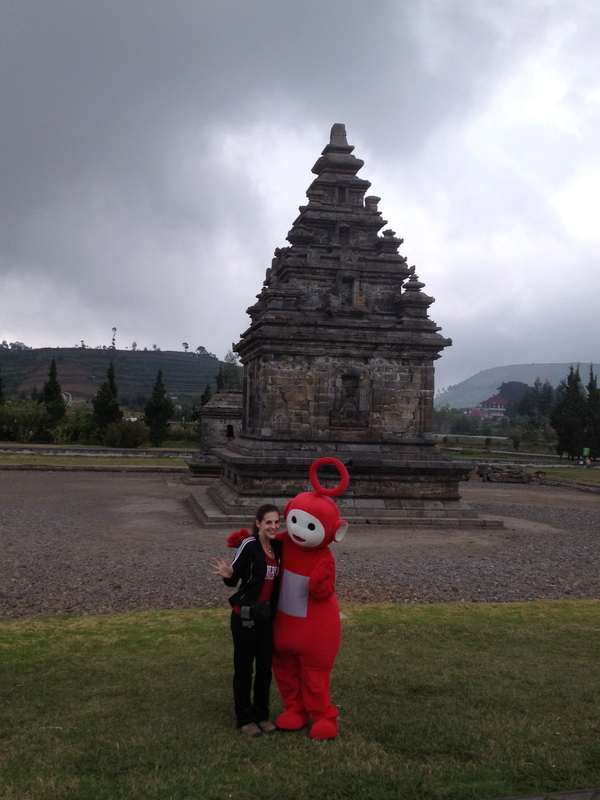 On the manicured hills near the temples, a man in a telly tubby suit posed for pictures and waited for tourists to drop a few dollars into his empty container of shortening. Like in the children’s TV show, the telly tubby’s body stood out against the green landscape: brightly colored and disconcertingly round. Now beside this sacred architecture, the creature projected an impression that was almost surreal and refreshingly offensive. As I was leaving the site, I saw the telly tubby bend down to posture himself contemplatively in the grass. A short walk away, a series of roofless houses were flooded with grass and flowers. Intrigued by the abandoned space, I walked among the walls. Besides trash and fallen roof planes, there wasn’t much to see and, more importantly, no one to tell me how this place had been half-overcome with rot. Upon turning back toward the main path, a hunched old woman blocked the route. I hadn’t noticed her. As we stood face to face, the old woman chewed on a betel nut and swirled the juices between her cheeks. When she opened her mouth to speak, her teeth — stained — glistened a bright red. You can’t be here, she said in an indecipherable mumble. I only understood her message when she flung her arms to the left in order show me the way out, at which point I nodded my head in preparation to leave. The old woman then complained about her eye. She wanted money. I’m not heartless, but I did not at the moment feel compelled to donate money within the confines of a ruinscape to a seemingly deranged old woman determined to whittle me out of my cash. Politely as possible, I attempted to move past her. The lady-beggar stood in my way and opened her mouth again. All I could see was crimson. Convinced this old lady had emerged from a horror movie, I fled quickly to the road, where I was left haunted by the chilling image of how humans might look if they perpetually bled from the mouth. Later, I asked a man at the homestay what happened to the abandoned homes near the Hindu temples. The man said the homes were part of a mushroom factory back when Suharto was in power, but that the industry went bankrupt since the former government was stripped from office in 2008. When I asked him how he felt about the evil old dictator, the man just smiled and said he was good for business. 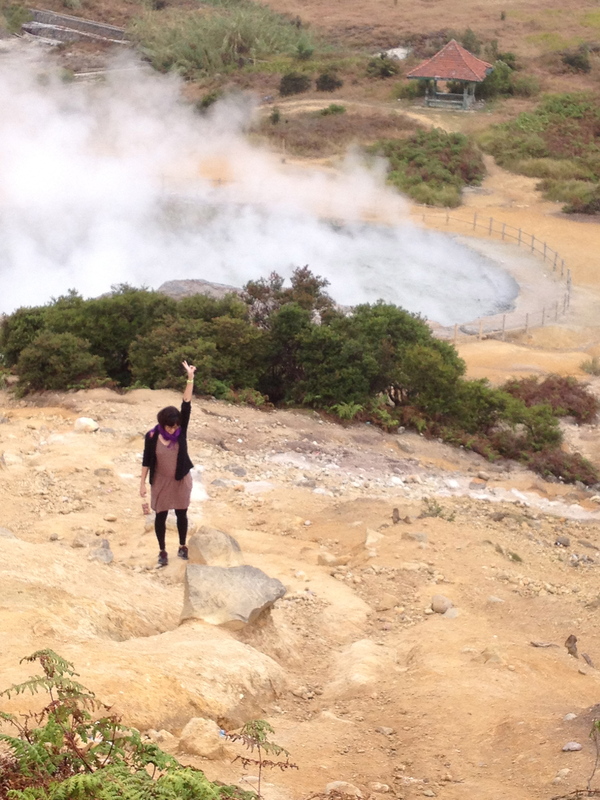 At 3:30 in the morning, Stefanie and I walked 1.5 hours in the dark past three villages and several geothermal plants to a hill beside a lake. The sun had already begun to rise. 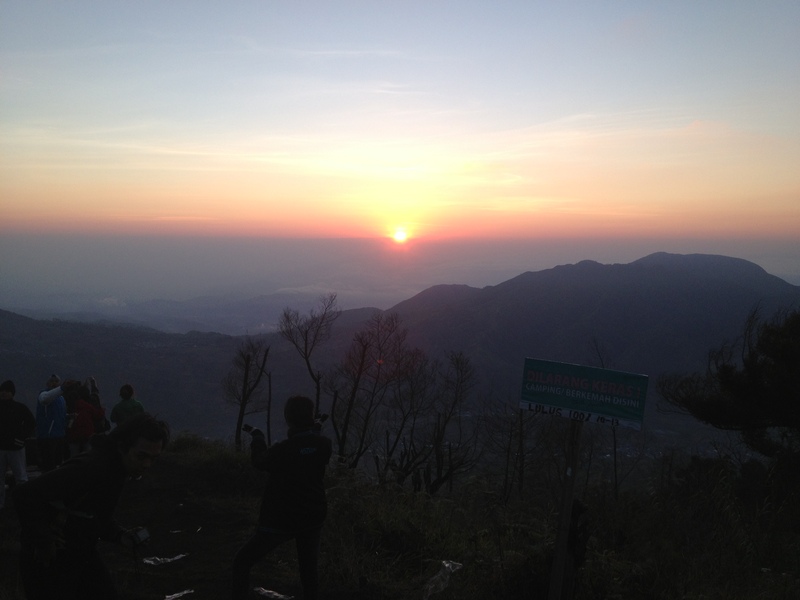 We climbed a miniature mountain to a pedestrian overlook where Indonesian teenagers posed for pictures with their cigarettes in front of an increasingly pink sky. A glimpse of something red appeared between the shadows of two mountains. As I watched the sun blend over the horizon, I recalled a life-sized poster from my childhood-home of a refined-looking woman in a white gown holding a symbolic light that floated magically above two open palms. I decided it was the closest thing to heaven I would ever see. Back near the homestay, Stefanie and I drank sweet ginger coffee with the village women. They ran a small food stand across from the homestay. All of them were Muslim. They occupied themselves during the day by relaxing in the cold and serving food to passerby. Their husbands farmed potatoes in the cultivated fields, which stretched across every hilled surface and lent the natural landscape the appearance of temple roofs not unlike the Hindu sanctuaries preserved nearby. 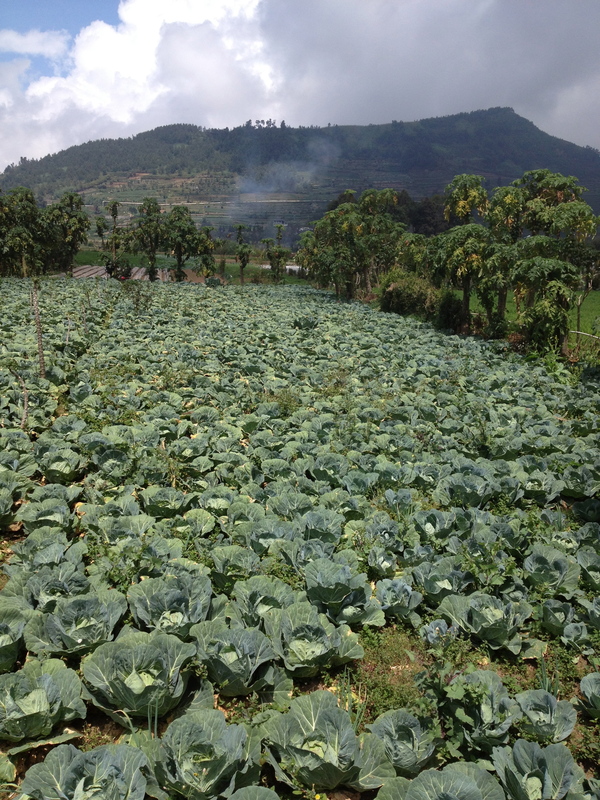 After seeing all the sights the town of Dieng plateau, the town — while still beautiful — seemed oppressively simple and cold. It was time to go home. I entered the lobby of the homestay to ask if the manager could assist my travel arrangements to Yogyakarta. The homestay manager sat with a thin old man who introduced himself as a driver. The old man smiled in my direction in a strange way that signified few interactions with white women. The driver’s cheekbones rose impossibly high on his skeletal face when I sat down. The man informed me that he was a nice man, that he took pity on me for not having enough money for phone credit (there was one sketchy ATM in the village and I didn’t dare use it). The skeleton-man cooed incomprehensibly. With a bony hand he pinched my cheek. He lived alone. He touched my leg, flickered light from his flashlight on my thighs and giggled, blew me a kiss and brought his face dangerously close to mine. Suddenly I had to leave. Thankfully dinner was mercifully cheap, so Stefanie and I were able to spend our last few dollars on a large beer to share. In the lobby downstairs we could hear that Skeleton-man was looking for me, but the homestay manager — who had already apologized for his friend’s rude behavior — told the old man that I had already gone to sleep. The next morning, the manager left town with us on the public bus. He traveled with a birdcage large enough to contain a human body. Upon entering the bus, several old ladies smiled at Stefanie and me with betel-nut teeth. Before descending the bus steps, the homestay-manager paid for us. We watched the homestay manager’s disheveled head from the window as he walked away with his cage, seemingly to nowhere.